Yesterday, Maoxian left a comment about my use of a 2 minute interval to find a ‘dummy’ entry and I wanted to explore this topic a bit more. Due to the fractal nature of prices, technical analysis can be applied with equal validity to almost any time frame: minute, hour, day, week or even monthly prices. Trendlines can be drawn, moving averages calculated, indicators plotted, etc… in fact, if we remove the reference to time, most people wouldn’t be able to distinguish a 5 minute chart from a daily chart or a weekly chart. Of course, when you approach extremes (say, a tick chart or an annual chart) then things are either moving so quickly that you lose track of the bigger trend or things are moving so slowly that by the time you react, the trend is over. So there is a sweet spot. But the range it contains is quite large. Alright, then how do we decide which timeframe to use? a 2 minute chart or a 5 minute chart? or how about a 15 minute chart? what is wrong with a 30 minute chart? The answer I think is it depends. There really is nothing wrong with a 2 minute chart, nor is a 15 minute chart inherently better than, say, a 30 minute chart. They all are snapshots of previous market action. And they each will present varying degrees of opportunity. So why did I use a 2 minute chart? Well, I knew that after the Fed announcement, the market would be a fast one with prices whizzing by with enormous speed and volatility. I wanted to zoom in on the exact opportunity that this volatility presented. And so, by default, I had no better option than a very small time frame. Needless to say, the more short term your focus, the more rapidly you’ll have to react. Event driven markets, like yesterday’s Fed annoucement, are rare. For more normal market conditions, and a more leisurely pace, pick out a longish time frame. Say, 15, 20 or even 30 minute charts. The point is that you have adapt to the market, not expect the market to adapt to you. If its a fast market, drill down to a smaller time frame. Otherwise, you may not even get a low risk entry. Premarket was very active with GM shares moving up extremely fast from $27.50 to $31 in no time flat. This is not a fiber optic company and I checked the calendar, it is not 1999. 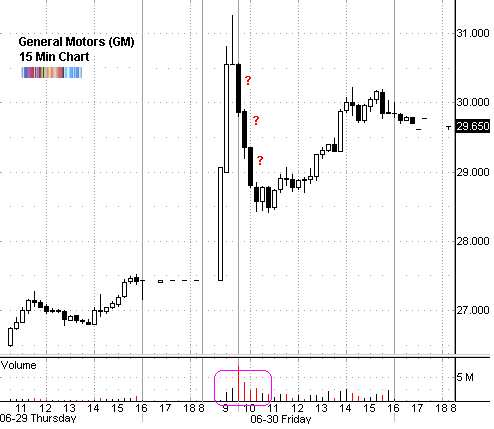 So this is your first hint that trading conditions are not ‘normal’ for GM today. Towards the end of the pre-market session, we have an inverted hammer with a very long upper tail (red arrow). This is a sign of buying exhaustion. Right after the regular session, price begins to tumble down from the lofty mount it attained in pre-market. There were two pauses where a low risk short entry was possible (red circles). The only chance you had was to get short right at the open, based on the pre-market action - below the long tailed doji. Other than that you had no entry offered on the 15 minute chart. And if you were not watching the pre-market session, you would have even missed the signal right at the open. Actually there were several upticks within 10 minutes of the open, all between 30.20 and 30.40, as well as between 29.80 and 30, and between 20.20 and 20.70, all in the first 1/2 hour of trading. Average RSI was above 85 on a minute chart for the first 15 minutes or so. 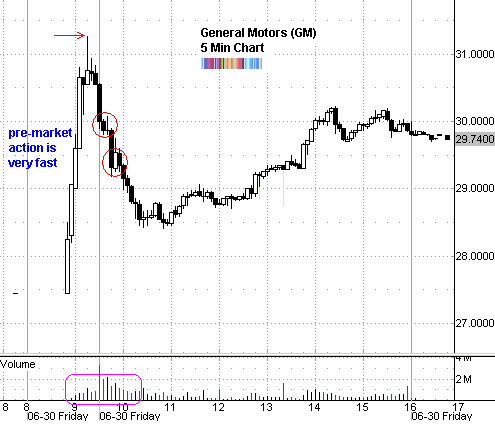 I think it was a bearish day overall for GM. Anytime the open is the high, with a gap up and 4x normal volume, you can just feel all those trapped shareholders looking for any point near $30 to sell! sell! sell! you use for premarket charting? Looks like it is set for filling the gap down there. I used stockcharts.com and a 1-minute interval chart. Hopefully this link will come through OK. Every minute except one in the first ten has upticks, as evidenced by the wicks and the presence of empty candles. One candle is filled with no wicks and possibly means there were no upticks in that minute … but every other minute candle shows upticks. The time frame on the chart is dependent upon the amount of time you are going to hold on to the stock and the risk appetite that you have. I would suggest a 30 min chart is most ideal for intraday,or at the maximum one or two days. It is also very helpful in looking for one complete Eliott wave pattern as this covers the entire up and down move for one wave pattern. The end of the day charts are for even longer time frames and so on. 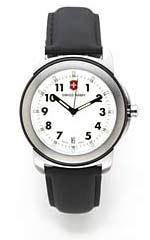 So if you are an investor who would like to have a longer time horizon then an end of the day chart would be ideal, and if you are an intraday trader then a 30 minute or 60 minute chart would be ideal. I would still like to go with the 30 minute chart for intraday trades. Are there any sites where minute (my-noot) time-frames are freely accessible? Or only in subscription services? My teacher/mentor in class every morning uses a 15m chart with bollinger band and slow stochastic indicators, to catch best price entries at the bottom. in day and occasionally overnight trades. But, monitoring daily and weekly charts at the same time. This scenario speaks to the importance of a 22-24″ wide-angle monitor, or multiple monitors, if pinpoint entries are critical to one’ strategy. Thanks Babak. Yes, I meant online. I’ll check out those references. Correct intraday intervall should be by logics which one has the lowest range bars standard deviation, according the rule that a trend is better than a choppymarket.